The 25.91 metre motor yacht Bluocean has been listed for sale by Jarrett Hiebert at Denison Yachting. 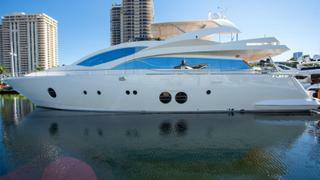 Built in GRP by Italian yard Aicon, Bluocean was delivered in 2010 and has been immaculately maintained since launch. Accommodation is for up to 10 guests in four cabins configured as a master suite, VIP suite and two doubles, each with a Pullman berth. The master and VIP suites come with flatscreen television sets and all cabins have en suite bathroom facilities while the crew quarters sleep four staff aboard this yacht for sale. In the saloon are two large settees to port and starboard, coffee tables, a bar and an entertainment centre including a television screen on a rise and fall mechanism plus a Bose Lifestyle stereo surround sound system. The spacious aft deck has plenty of room for al fresco cocktails and dining while a staircase leads down to a huge stern garage with space for a tender, jet ski and a dive compressor. Up in the flybridge guests are offered a dining table with seating for 10, a custom barbecue grill, Jacuzzi spa tub and an L-shaped bar with a fridge and ice maker, all sheltered by a Bimini retractable top. Twin 12V MAN diesel engines enable a cruising speed of 24 knots topping out at 27 knots and she is fitted with Seakeeper zero speed stabilisers. Lying in Miami, Florida, Bluocean is asking $2,700,000.